The Erfurt factory is located in the Thüringen region of Germany and the nine factories that were located in this region are the most difficult to identify to a particular factory. 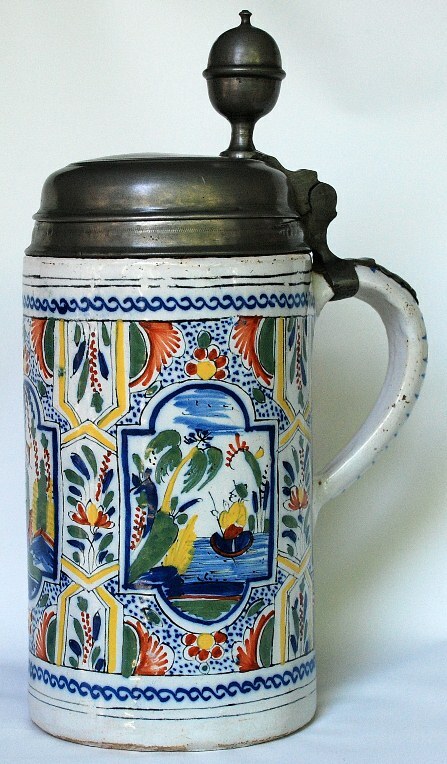 You will often see faience steins from this region identified as Thüringen rather than a particular factory. 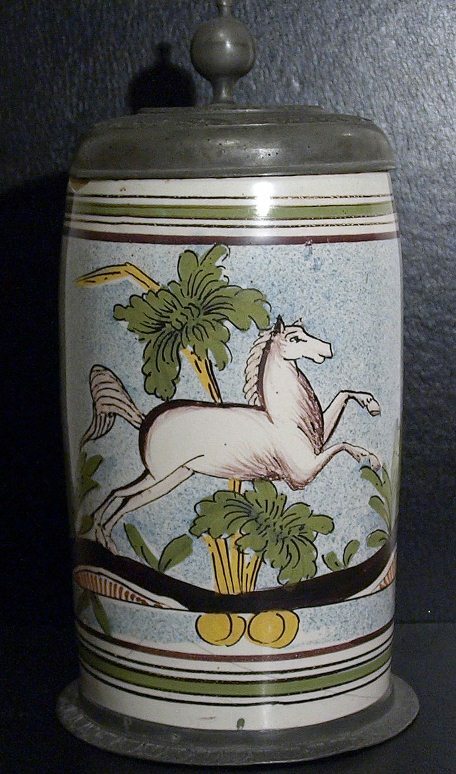 In the database that I included in part 1 of this series, about half of the faience steins were listed from the region rather than a specific factory. 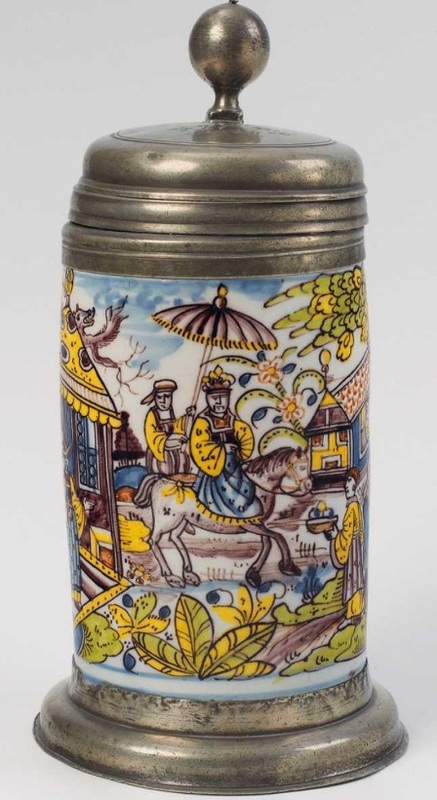 The Erfurt factory may be the easiest factory from the region to identify due to some unique decorations, which will be discussed later in this article. 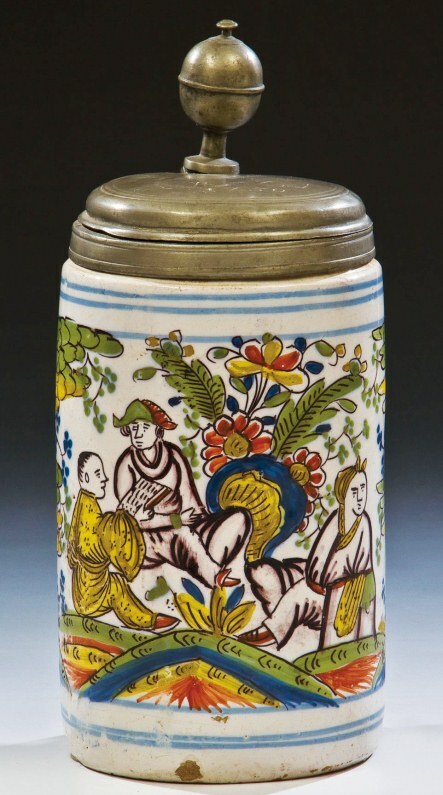 For anyone looking for more information about faience in this region there is an excellent book available titled THURINGER FAYENCEN by Adelheid Manhert & Constantin Beyer. This book was published in 1993 and has some great color photographs. 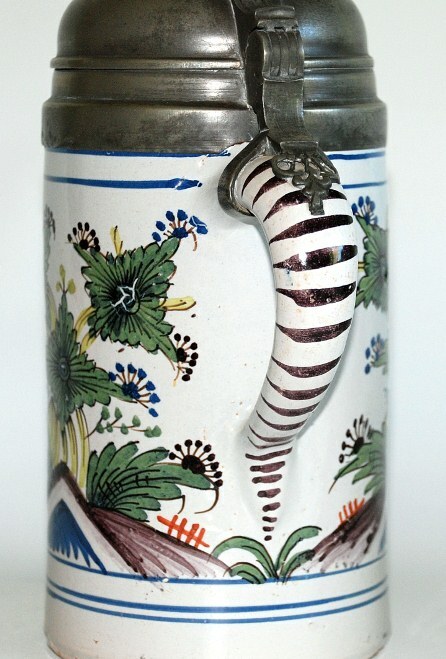 Figure 1 shows a typical Erfurt stein with no pewter work. 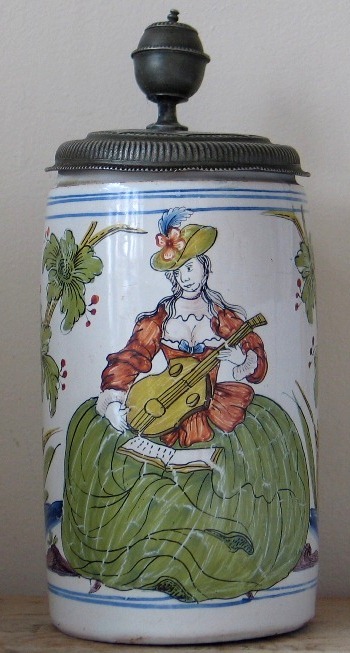 The body has straight sides at the bottom and the top is indented where the lid ring fits. 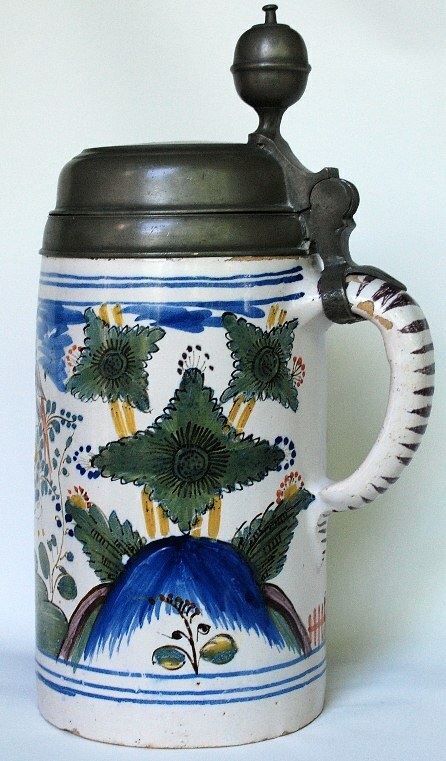 Erfurt steins often have the pewter base missing, as can be seen in other photos in this article. 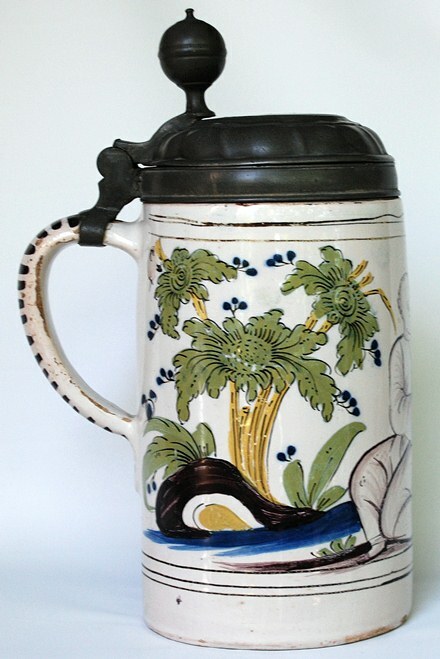 The body design is typical for northern faience steins. 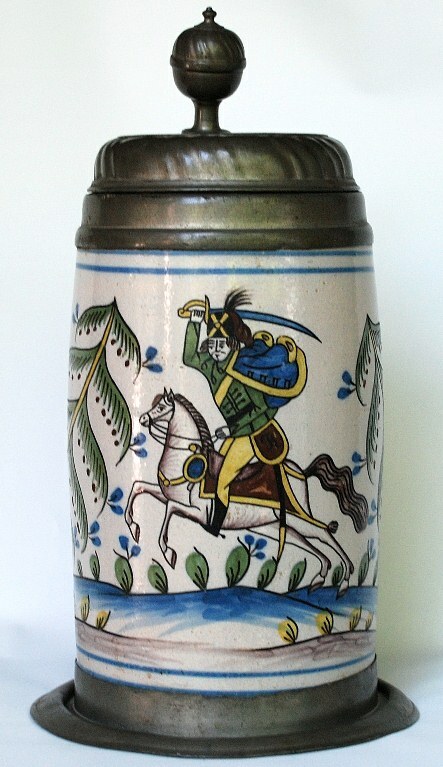 A typical Erfurt handle is shown in Figure 2 and Figure 3. 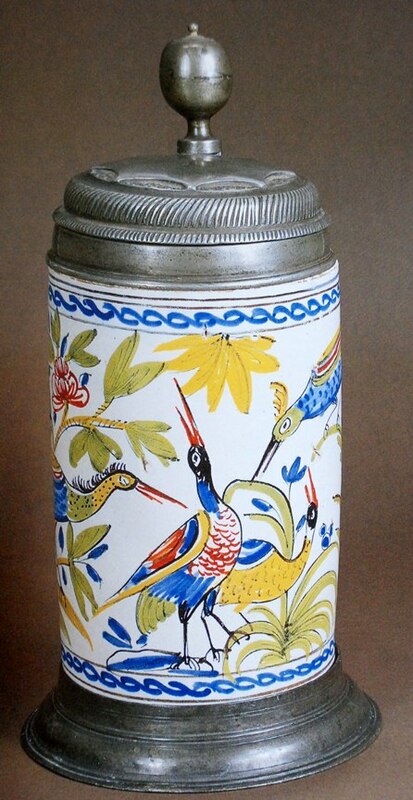 The handle is tapered from top to bottom with the top about twice as wide as the bottom. The cross section of the handle looks like a D, being flat on the inside and rounded on the outside. 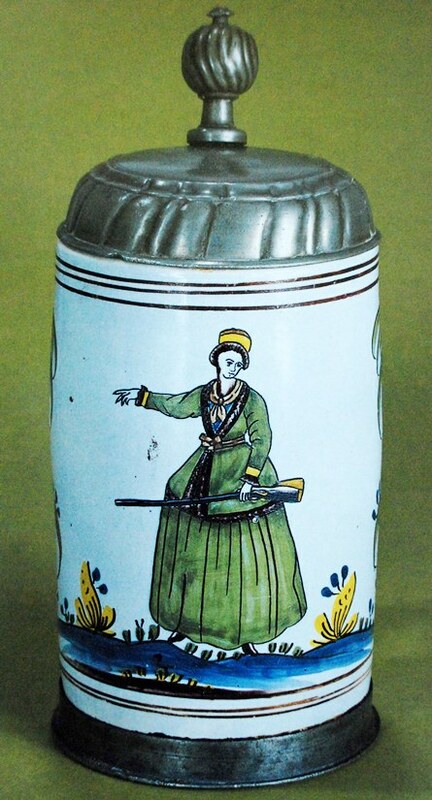 The only difference between the two handles is the lower handle attachment, one being pointed and the other rounded. 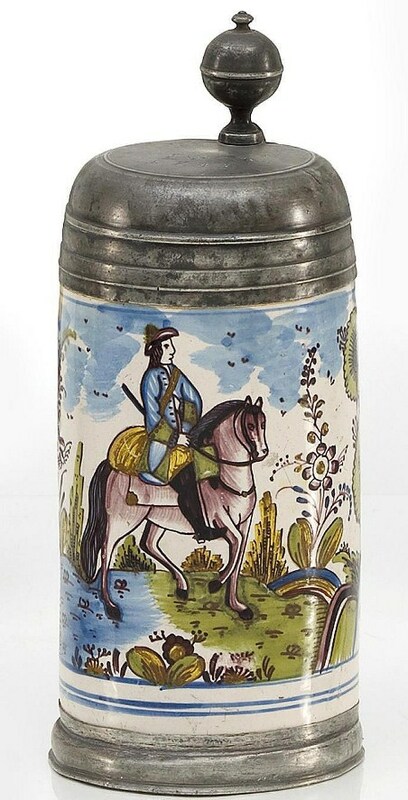 Many other Thüringen region faience steins have similar handles, which is one of the reasons that make these faience steins hard to identify. 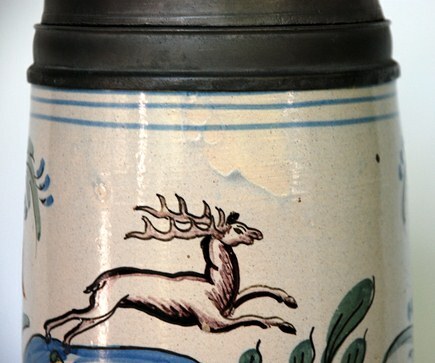 Figure 4 shows the factory marks that can be found on a few Erfurt steins but most pieces do not have any factory marks, but can be found with artist marks on the bottom. 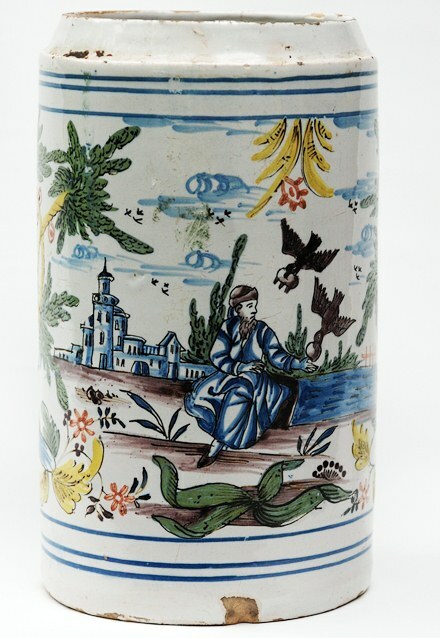 The wheel factory mark is also found on Hochst faience, which is a southern faience factory located in the western German region. 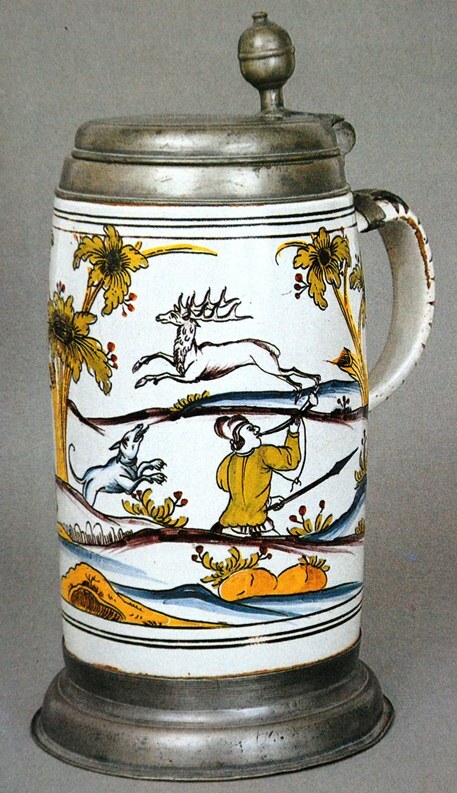 There are several decoration styles that can help identify Erfurt faience steins. 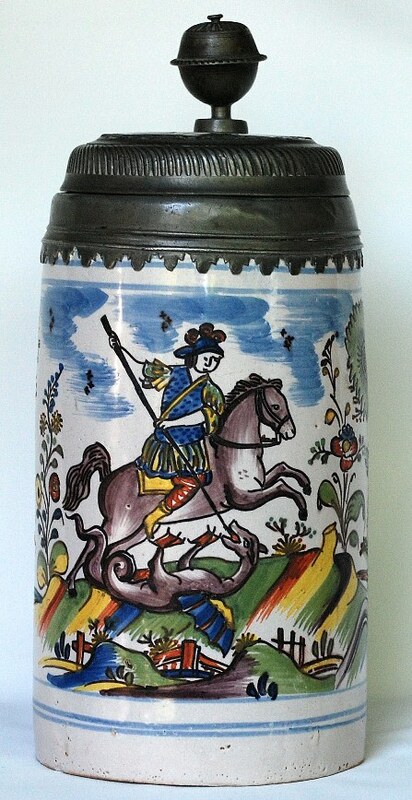 On some steins, you will find a multi-colored diagonal stripped ground, as can be seen in Figure 5. 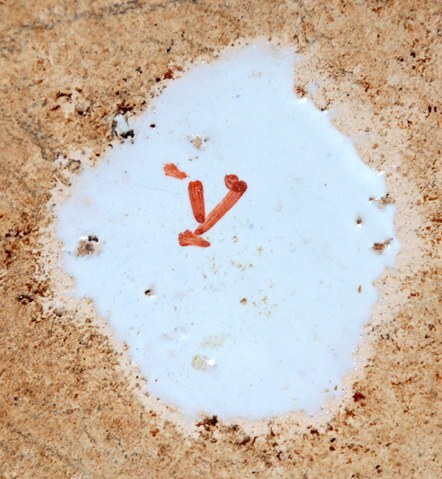 An artist mark of a V can be found on many of the steins with this decoration, as shown in Figure 6. 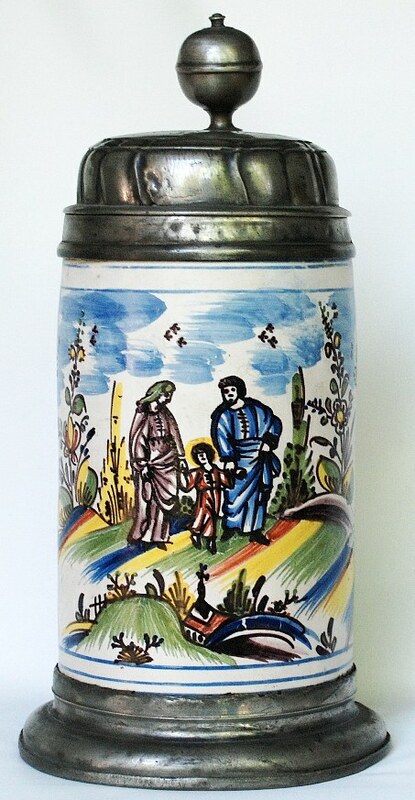 Erfurt steins often have a unique side scene. This scene is usually three green flowers with a sun burst in the center. The flowers can be round, square or diamond shaped, or sort of a rectangular shape and Figures 7, 8, and 9 shows each of these decoration styles. The rectangular shaped flowers show in Figure 9 can also be found in yellow. 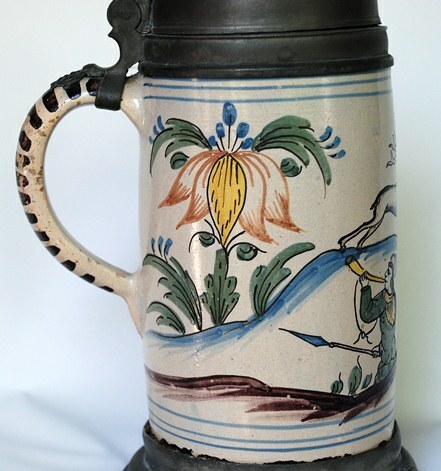 This type of side scene is often found on the steins with the multi-colored diagonal ground decoration. 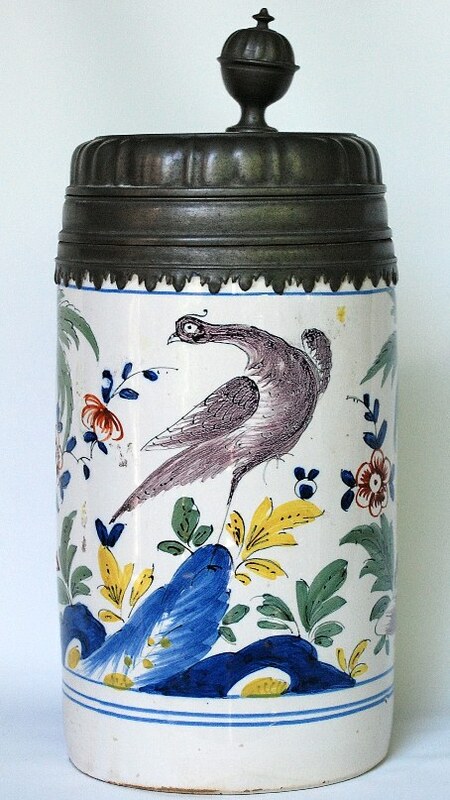 A stein with a lot of green in the decoration is also thought to be from the Erfurt factory as shown in Figure 10. For a long time, I did not know why this over glaze was added, but now I have a theory. 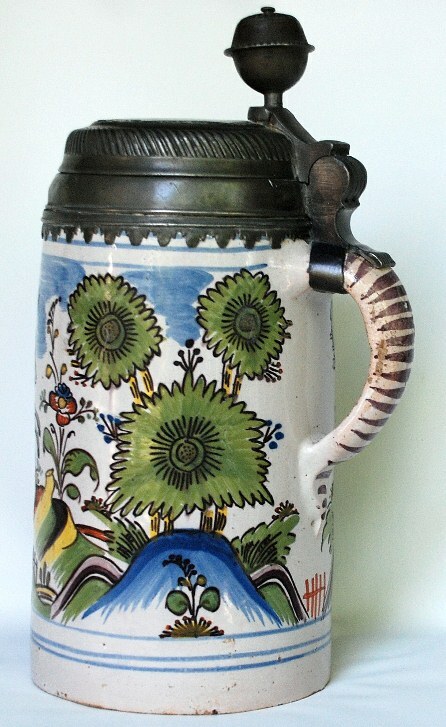 When writing this article I took a closer look at my steins. 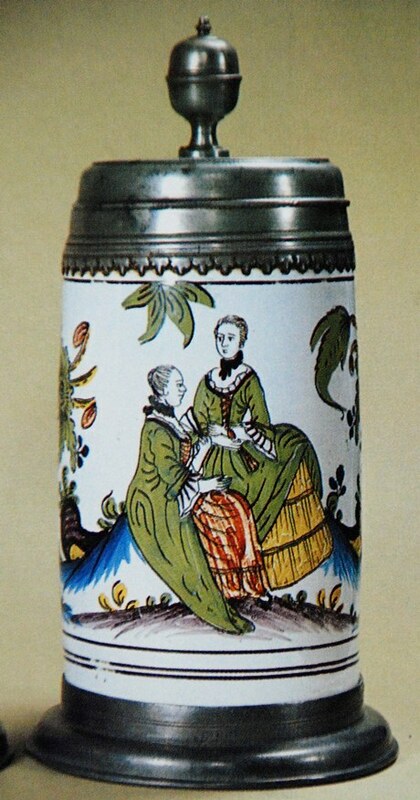 What I found was that the white background (which usually on an Erfurt stein is a nice bright white) was more of an off white color, almost a very light tan. I now think that the light blue tint to the over glaze was added to try and make the background visually appear whiter. 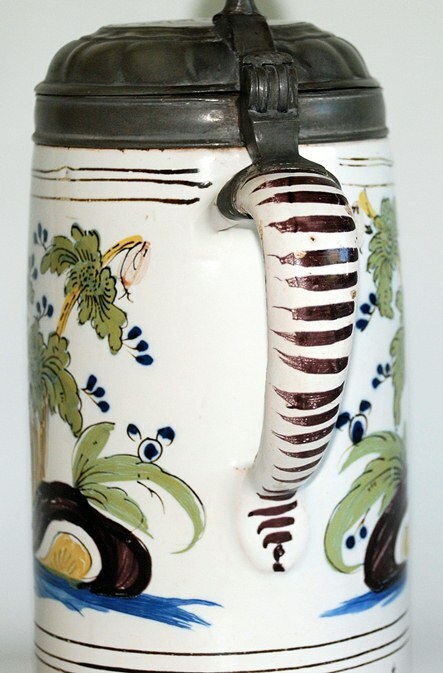 Figure 12 is a side view of the stein in Figure 11 and you can see the off white color of the handle when compared to the body, which appears whiter. Fig. 12,, and end of the written part of the article. 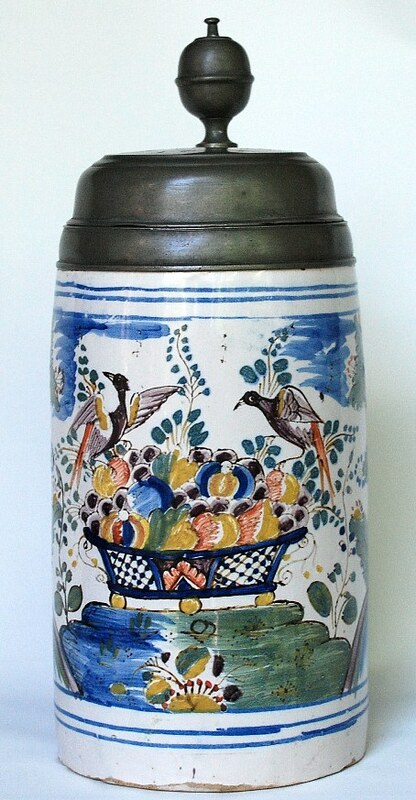 Additional photos of Erfurt steins were shown below, in the Prosit article, for the reader’s edification. 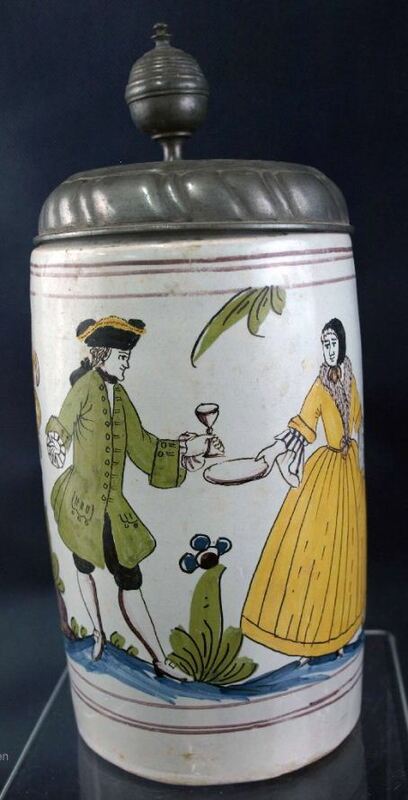 THE FOLLOWING PHOTOS WERE NOT PUBLISHED IN THE PROSIT ARTICLE, BUT WERE PROVIDED BY BILL HAMER.